Juice Beauty's skincare products are something that I'm seeing more and more people mentioning online, and having tried out a couple of things from them late last year (review here), I was eager to test out some of their makeup range to see if it was just as good. Juice Beauty's skincare has been around for over a decade, but their Phyto-Pigments organic makeup range is a brand new addition to the brand that officially launched last year. There was a lot of fanfare and press surrounding it because of Juice Beauty's partnership with Gwyneth Paltrow (she's the Creative Director of this new makeup line, and Juice Beauty have also helped her to develop her own Goop skincare range too), so I was curious to see if all the hype was justified. Sticking to JB's strict ethical principles and standards, as well as their strong eco-friendly ethos and commitment to the environment, the Phyto-Pigments makeup range is cruelty-free, uses a high percentage of certified organic ingredients, and everything is free from parabens, petroleum, synthetic fragrances, artificial dyes, sulphates and silicones. The products are formulated with an interesting base composed of organic fruit and botanical juices instead of using water, and the brand prides itself on its innovative Fruit Stem Cell technology to deliver an effective range of organic beauty products. I've been testing out Juice Beauty's Phyto Pigments Illuminating Primer and one of their Liquid Lips to get a feel for what their makeup range has to offer. When it comes to creating a good base, an excellent primer is an absolute must in the quest to achieving that coveted flawless, glowy, selfie-ready skin. That said, I do have a love/hate relationship with illuminating primers as I have a typical combination skin type - some of them just make me look 'greasy' instead of 'glowy', but I'm happy to say that this one provides the latter! I think this primer works so well for me because it has such a great serum style formula (this whole range is basically 'makeup with skincare benefits'). It absorbs easily, goes on smoothly, feels wonderfully lightweight and hydrating, and it does an incredible job of cheekily 'blurring' away any imperfections. Needless to say, it provides that smooth groundwork that you need for getting the most out of your foundation, yet it also looks good on its own to wear on days when you don't want a full face of makeup and still want a healthy looking, brighter glow to your complexion. There are a lot of brands who throw around the whole 'Photoshop in a bottle' claim, but this is one of the few primers that I've tried which I would happily attach that label to. Seriously good stuff, and you'll be pleased to know that a little goes a long way, so it's a worthwhile investment for all you glow-getters! Liquid Lip products have been a massively popular trend and continue to be, so it's great to see more organic and green beauty brands developing their own versions. However, this one from Juice Beauty just isn't cutting it for me. Rather than being a straight-up liquid lipstick, this is much more like a regular lip gloss with a medium amount of coverage/pigment added to it. It looked very promising when I swatched it on the back of my hand, but on my lips, the texture is just a bit too watery and thin for my liking and because of this, it doesn't last longer than half an hour before I need to reapply. Despite this, I do love the initial high-shine, glossy finish, and this pinky coral shade Drew (named after Drew Barrymore) is an absolutely beautiful colour for Spring, plus the ingredients are brilliant as it feels moisturising on the lips and isn't sticky. Nonetheless, I feel it's too expensive when you compare it to something like the ILIA Lip Glosses which are cheaper, also organic and last longer on me. 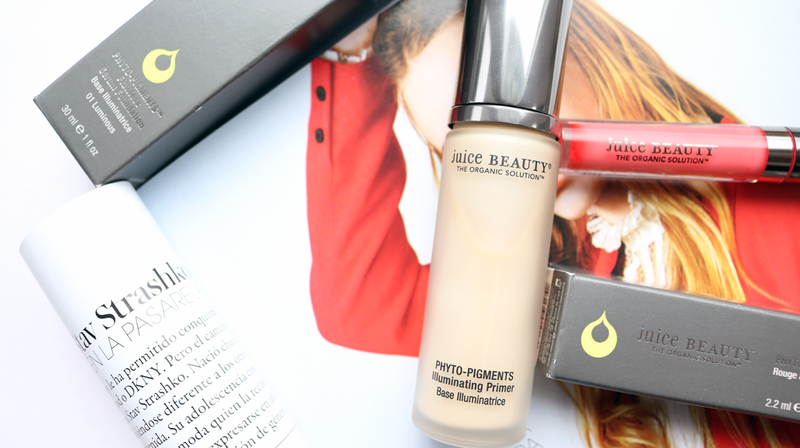 The Juice Beauty Phyto-Pigments organic makeup range is available in the UK from Naturisimo.com who offer free worldwide shipping. 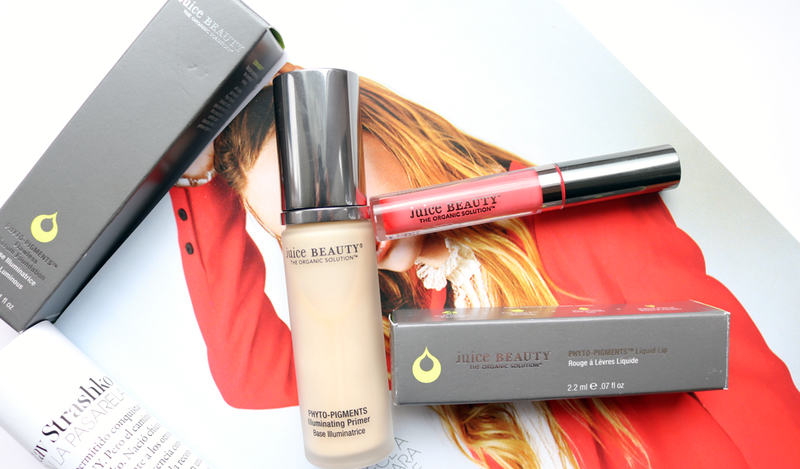 Have you tried any makeup from Juice Beauty? I haven't tried anything yet, and although the products you've tried looked nice they seem very expensive for what they are!